Description: The smallest of Tanzania’s national parks, Gombe is a narrow strip of chimpanzee habitat on the shore of Lake Tanganyika. 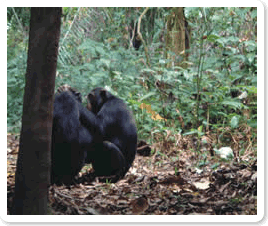 Its chimpanzees – habituated to human visitors – were made famous by the pioneering work of Jane Goodall’s studies. The matriarch, Fifi, the last surviving member of the original community, only three years old when Goodall first set foot in Gombe, is still regularly seen by visitors. Tracking the chimps is a fascinating experience. It’s likely that you will observe them grooming each other in small groups, squabbling noisily, or bounding from tree to tree swinging on vines. Watching a mother chimp with her offspring is truly remarkable. Difficult to reach and relatively expensive, Gombe has few visitors each year. Location: Just north of Kigoma, on the shore of Lake Tanganyika. 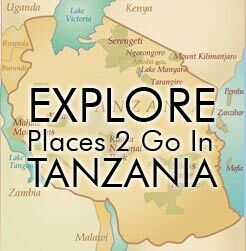 Usually requires flight with Precision Air from Dar es Salaam (daily) or a shared charter flight from Arusha that flies on Tuesdays and Fridays only. A train (takes 2-3 days) from Dar might be possible. Time: Set aside at least 4 days (1 to get there, 1 to return and at least 2 nights actually in the park). Animals: Chimpanzees, baboons, red-tailed and red colobus monkeys, more than 200 bird species.